Emails are a crucial part of communication and collaboration within and outside any organization. From daily operations to decision making, they play a vital role in business. If used smartly, they can prove to be valuable assets, however if not organized and used properly, they may lead to problems in communication, collaboration as well as compliance with regulations. Docsvault’s Automatic Email Capture is a smart way to capture, organize and index email communications and attachments. 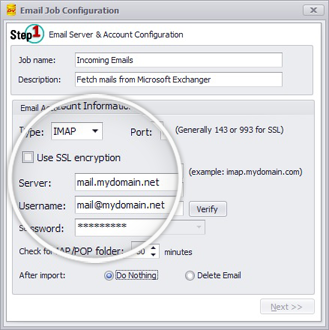 It allows you to capture emails from your company email servers, email servers hosted with ISPs and even from services like Gmail, Hotmail & Yahoo and store them in neatly organized folders. It is smart enough to allow you to capture only desired emails and attachments, so that you get only your desired emails in the repository without having to search through them manually in your mailbox. Set criteria on To, From, CC, BCC, subject, body, etc. Archive email communications by account, sender, year, etc. Automated email capture is one of the most helpful tools in electronic document management, system. It speeds up communication by delivering your important emails straight to your repository and allowing you to make decisions faster. It also allows you to safeguard important emails and attachments for future reference, compliance and legal purposes. Automatic Email capturing is very useful for importing faxes, orders, applications, etc. that are received as emails. You can configure Docsvault to capture only those emails that are important to you, while leaving the less important ones in your mailbox. It can automatically store certain incoming and outgoing emails depending on criteria you set on variables like From Name, From Email, To, CC, BCC, etc. All the emails captured can be indexed for quick retrieval in future. This is one of the most important time-saving features in terms of communication, decision making and e-discovery. Docsvault can automatically file captured emails into appropriate folders based on captured dynamic values. This allows you to file all your emails in relevant locations. Produce required electronic emails and attachments during legal actions. Automated email capture means you spend less time searching through emails and get important emails directly delivered to your repository. Reduce customer response turnaround time and answer their queries effectively. Import all your scanned files and documents derived from third party applications and save them to Docsvault automatically.